There’s already a barebones Unity MonoBehaviour called SinkingBehaviour.cs, which is a component on the PlayerShip and PirateShip prefabs. In the Unity editor, navigate to the Assets/Gamelogic/Pirates/Behaviours directory. 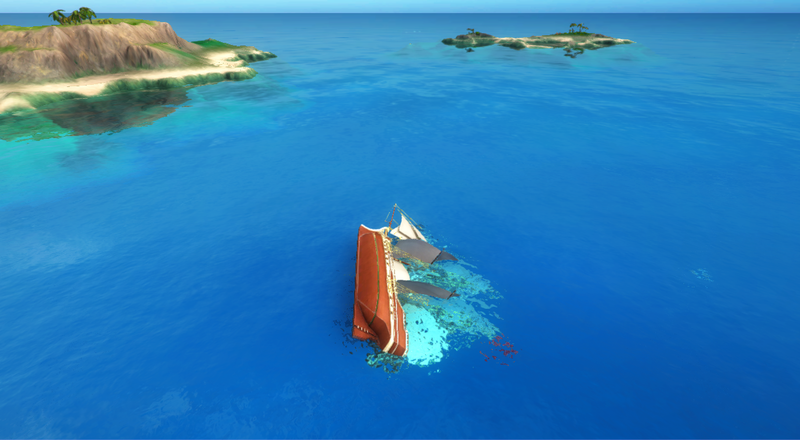 SinkingBehaviour.cs needs completing so it plays a sinking animation when a ship’s current_health reaches zero. As in previous lessons, this MonoBehaviour should only be enabled if it has access to the component. In this case, it only needs read access. This line also makes sure that SinkingBehaviour is only enabled if the Health component exists on the ship. In this section, you’ll write the function that’s called whenever the ship’s Health changes. It needs to check what the updated current_health is, and play the SinkingAnimation if the current_health is below 0.
alreadySunk is used to check whether a ship has already sunk to avoid playing a sinking animation twice. This uses OnCurrentHealthUpdated as a synchronous callback: a function that runs every time the CurrentHealth property of Health is updated. If alreadySunk is false and currentHealth is below zero, it calls a function that plays the sinking animation and disables the particle effect for the ship’s trail in the water. At the beginning of OnEnable(), add the following line: csharp alreadySunk = false; This is because this project uses prefab pooling. Prefab pooling allows Unity to reuse GameObjects to represent different entities. Including this line ensures that, when this script is enabled, a ship entity with health > 0 doesn’t appear as a sunk ship just because the ship entity that was previous associated with this GameObject was sunk. Register a callback to run OnCurrentHealthUpdated whenever the entity’s CurrentHealth changes. In lesson 4, you registered callbacks for whenever an event was triggered. Callbacks for property changes are similar: instead of using ComponentReader.<event name>Triggered.Add(), use ComponentReader.On<property name>Updated.Add(). HealthReader.ComponentUpdated.Add() would invoke the method every time any property of Health changed, or any event on Health was triggered. HealthReader.CurrentHealthUpdated.AddAndInvoke() would invoke the callback immediately with the current component values upon registration. * must not visualize the ship as still alive. * Therefore, on checkout, any sunk ships jump to the end of the sinking animation. You don’t need to build any changes this time. This is because all the changes have been made to Unity code, and you haven’t added or removed components from a prefab. So when you run a client from Unity, Unity refreshes code changes automatically. Note: If you wanted to run a client from the command line instead (using spatial local worker launch UnityClient default), you’d need to build worker code, using the SpatialOS window: Workers > Build. Run the game locally from the SpatialOS window, then run a client from Unity. Find another ship, and press E or Q to fire a cannon at it. After four hits, the ship should sink. To stop spatial local launch running, use Ctrl + C.
So far in the Pirates tutorial, you’ve always run your game locally. But there’s an alternative: running in the cloud. This has some advantages, including making it much easier to test multiplayer functionality. To try out deploying to the cloud, try the optional lesson Play in the cloud. Congratulations, you’ve finished this feature! Learn about another aspect of components: component commands. Try playing your game in the cloud by running a cloud deployment.